The Amish Lyndon Swivel Bar Stool brings the classic comfort of traditional style furniture and combines it with the stand out shapes of the contemporary for a winning style! Enjoy a swiveling bar stool at your gorgeous kitchen counter or provide just the right seating you've been looking for in your game room. The Lyndon offers a transitional style that adapts easily to different room decors. 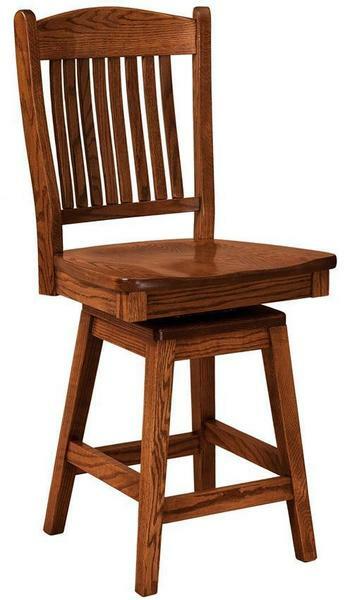 The solid wood construction of this bar stool will last and its style will too! Consider the many roles solid wood bar stools can play in your home. In the Kitchen: Enjoy casual dining at the kitchen counter, island or bar. View the Lyndon Dining Room Chair for a matching design throughout your home. Seat Height from Back: 20 1/4"